(NaturalNews) After publishing an article last week which explained that dissidents in China believe Tianjin was hit by a "Rod of God" secret space weapon from the Pentagon, I've looked more closely at the physics and telemetry control required to place such a weapon on target. Some observers have come to the conclusion that the complexity of such a weapon system is too high for it to be a reality. They've cited several reasons for their skepticism, including the difficulty of overcoming orbital velocity, atmospheric re-entry problems, flight telemetry and so on. Some have also questioned whether the kinetic energy of such an object would be large enough to make any sort of meaningful impact on a ground-based target. However, after analyzing the capabilities already found in today's precision-guided munitions -- such as Raytheon's Excalibur guided artillery projectile, I've come to the conclusion that today's weapons technology is more than sufficient to build and deploy a functioning "Rod of God" orbital kinetic weapon platform. Furthermore, I've shown some estimated math, below, that indicates how a "Rod from God" space-based weapon could deliver 3-4 tons of TNT explosive equivalent to any land-based target on Earth. This is precisely in the range that was reported for the first explosion at Tianjin. The primary objection to the "Rod of God" weapons system says that such a system can essentially only drop weapons onto targets that are directly beneath the orbiting platform. However, this objection doesn't pan out. In reality, laser-guided bombs (LGBs) and other precision munitions have remarkable lateral maneuverability even though they possess no thrust or rockets themselves. By simply altering small control surfaces, they can "glide" laterally onto designated targets that are far from being "directly beneath" the launch platform. For example, this Raytheon video show a precision-guided artillery shell striking numerous targeted within 1.6 meters, even after flying 33km or more through unknown winds after being fired from an artillery cannon. Some observers have stated that guided munitions ("rods") could not survive re-entry into the atmosphere. However, guided munitions already exist that are ridiculously hardened, including the "BLU-122-5000 pounds, with internal components able to survive 10,000 Gs of lateral acceleration and still function at the bunker level," reports MilitaryAerospace.com. Keep in mind, too, that precision-guided artillery shells obviously survive being shot out of an artillery cannon, subjecting them to extreme heat, acceleration and friction forces. Some people who object to the idea of Rod of God space weapons incorrectly state that the orbital space platform would be placed at too high an orbital velocity relative to the Earth, requiring kinetic weapons to need excessive "braking" in the atmosphere to bleed off lateral orbital speeds so that they could drop vertically onto intended targets. This objection incorrectly assumes that the Rod of God platform is in low Earth orbit, requiring orbital speeds of around 8km/s relative to the planet to stay in orbit. The assumption is false, however. The farther the orbit from the planet, the smaller the relative orbital speed differential. For example, if you place a satellite into geostationary orbit (35,786 km), its relative orbital velocity to the planet's ground speed is exactly ZERO (which is the whole point of a geostationary orbit). Interestingly, if you place a Rod of God weapons platform into a semi-synchronous orbit at a distance of 20,350km from the planet, the platform will orbit the planet every 12 hours while maintaining very slow velocity relative to the movement of the land below. A semi-synchronous orbit (or a quad-synchronous orbit with a 6 hour orbital period) would allow the Rod of God platform to (nearly) cross over the continents twice per 24 hour period, all while maintaining an orbital velocity of just 3.86km/s (a velocity that's even lower, relative to the ground, if the orbit is placed in alignment with the Earth's rotation). From this orbital altitude, a rod could be dropped onto the planet in a matter of just a few hours (the actual orbital decay time depends on orbital velocity, angle of trajectory and other factors). These orbital velocities, by the way, only speak to the relative speed of the launch platform compared to the movement of the Earth's land mass. They don't address the more important question of the vertical "drop" velocity of the rods. Next, I examine the vertical drop and the kinetic energy delivered on target. As you ponder this issue, remember that in space, every planet rests at the bottom of a so-called "gravity well." Ground zero is the bottom of the well, and high orbit is high above the well. The higher you are (i.e. the greater your distance from the planet), the greater the kinetic energy you have "stored" in the object you're dropping onto the planet. In space, in other words, the "high ground" is high orbit. Tactically speaking, you want to maximize the energy delivered to the intended target by the Rod of God weapon, and this means you want to maximize the velocity at which the rod strikes the ground (without burning up your rod in the atmosphere). Because energy = one-half the mass times velocity squared, the velocity achieved here is far more important than the mass itself. Essentially, you want to "drop" a rod from a very high orbit in order to maximize its velocity and energy. Because the acceleration of gravity is 9.8 meters per second per second (on Earth, anyway), the higher you place the orbital platform the higher the velocity of the object when it strikes the atmosphere. Naturally, there is a limit to the speed a given object can maintain in free-fall through atmosphere. This is called "terminal velocity," and the more aerodynamic your object (i.e. the less drag it has), the higher the terminal velocity in atmosphere. If your object is moving too quickly, it can be "burned up" in the atmosphere (obliterated by frictional forces). So there is a practical limit to the velocity your object can survive. A large, high-density rod with a tapered leading and trailing edge would slice through the atmosphere with very little drag, maintaining a relatively high velocity until impact, thereby carrying the maximum kinetic energy to the target. Tactically speaking, you would want to drop these rods from the highest altitude possible without exceeding their survivable speed limit upon striking atmosphere. I don't personally have the materials science background to know what sort of materials and densities are capable of achieving this. Such data, if it exists, would obviously be classified top secret, which means Hillary Clinton probably emailed it to somebody from her unsecured mail server. According to Apollo by the Numbers, most of the later Apollo capsules -- with men living inside them -- re-entered the atmosphere at velocities of around 36,000 feet per second, or over 10 km/s. This is both lateral speed and vertical speed, by the way, with the vast majority of this velocity appearing in the lateral (orbital) vector, not the vertical vector. Note that the Apollo capsules are not aerodynamic by any stretch of the imagination. They are shaped to brake in the atmosphere, bleeding off velocity in exchange for heat generation by molecular friction impacting the capsule's heat shield. If you are designing an unmanned kinetic weapon, you don't need to bleed off speed. In fact, you want to maintain maximum vertical speed through the atmosphere so that the maximum energy can be delivered on target. If the Apollo capsule can withstand 10 km/s re-entry speed at the upper layers of Earth's atmosphere (where the molecular density is thin), we can reasonably guess that an exotic rod-shaped kinetic weapon made entirely of high-density materials and shaped with a ridiculously low drag coefficient could likely enter at four times that velocity, or 40 km/s. Slicing through atmosphere will, of course, cause dramatic friction on the object, creating heat and a braking effect. What's the terminal velocity of such an object? We have some simulation data to help answer this question. According to this scientific simulation paper from Defence Science Journal (Defence Science Journal, Vol. 64, No. 6, November 2014, pp. 502-508, DOI : 10.14429/dsj.64.8110), the terminal velocity of a supersonic artillery shell is roughly 1km/s in low-Earth atmosphere. A higher density "rod" weapon designed with exotic materials and dropped from high Earth orbit would obviously arrive on target at some velocity higher than 1km/s, but we don't know how much higher. 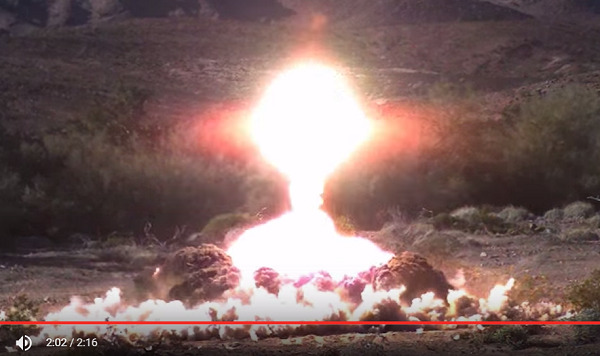 Conservatively, let's estimate four times the velocity of an artillery shell, or 4km/s. In case you're curious, this is roughly Mach 12. Can anything really move through the atmosphere at Mach 12? BrahMos-II is a hypersonic cruise missile currently under joint development by India's Defence Research and Development Organisation (DRDO) and Russia's NPO Mashinostroeyenia. It is the second of the BrahMos series of cruise missiles. The BrahMos-II is expected to have a range of 290 kilometres (180 mi) and a speed of Mach 7 (8,575 km/h; 5,328 mph; 2.3820 km/s). During the cruise stage of flight the missile will be propelled by a scramjet airbreathing jet engine. It is expected to be ready for testing by 2017. Back to the Rod of God, the greater question here, however, is whether the rod can survive the atmospheric re-entry speed that's necessary to result in it striking the ground at 4km/s. The real question here is: Can a "Rod from God" weapon survive V1? Or will it "burn up" from friction with the atmosphere? We can't know the answer to this, and the Pentagon isn't telling. But we can guess that the space weapons industry is at least two decades ahead of what they're telling the public. or stated as 16 x 10^9. The atomic bomb dropped on Hiroshima unleashed approximately 64 TJ (terajoules), or approximately 4,000 times the kinetic energy of our Rod of God weapon. Because one ton of TNT is equivalent to 4.184 × 10^9 joule (J), if our exotic rod weapon unleashes 16 x 10^9, then it delivers the energy of four tons of TNT onto the target. 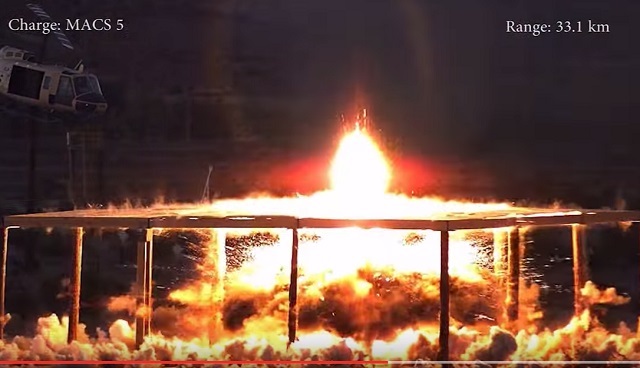 Is four tons of TNT useful as a tactical weapon? If you can deliver it on target from space, it certainly is! Interestingly, this is right in line with the reports from Tianjin, China, where two explosions took place. It was widely reported in the media that the first explosion represented about 3 tons of TNT, setting off a secondary explosion that reached about 21 tons of TNT. The second blast was equal to about 21 tons of TNT exploding, while the first was the equivalent of about 3 tons of TNT, according to numerous reports. In other words, a "Rod of God" weapon could have conceivably achieved a 3-ton TNT equivalent, and if delivered directly on target, it could have easily set off the secondary chemical explosion. How could the Rod of God reach targets that aren't directly underneath it? Those who are assuming the Rod of God orbital weapons platform must drop the rods STRAIGHT down are making a tremendous error. No such limitation exists in space. There's no reason why the launch platform can't rotate before launching the rod on a desired trajectory, and there's no reason why a rod can't have a small, detachable thruster motor that works in space (yet detaches before atmospheric re-entry). The initial trajectory angle of the Rod of God upon launch could allow it to reach almost any land-based target on the planet below. A relatively small thrust charge ignited after launch could drive the trajectory in any direction in space. This is especially the case if the launch platform is orbiting far from the planet, allowing more time for launch vectors to alter the final arrival destination below. Once the rod reaches atmosphere, small changes in control surfaces could easily glide the rod to within 2 meters of any intended target on impact, using the exact same technology that already exists in precision munitions on Earth (tiny adjustable surfaces near the tail). 1) The ability to rotate the platform to launch the rods at varying angles relative to the planet. 2) The ability to add thrust to the rod itself through a small, one-time rocket motor. 3) The ability to guide the rod using existing precision munitions technology that alters control surfaces in the atmosphere to deliver munitions on target. Notably, this does not mean that the Rod of God platform can hit any target AT ANY TIME. It cannot. This is the limitation of the system. It must wait for the precise launch window of opportunity, which only appears once every few hours, depending on the placement of the orbit, the direction of the orbit relative to the Earth's spin, and so on. However, within a given timeframe (let's say from 6 - 24 hours), the Rod of God platform would be able to strike any target on Earth, and that's more than sufficient for the Pentagon's strategic bombardment requirements. The other limitation is that from the time of launch, the Rod of God might take many hours before arriving on impact. This "time of flight" can be easily calculated if you know the orbital altitude, orbital velocity, launch velocity, launch vector and booster thrust acceleration and duration. Depending on these factors, this time of flight could reasonably be anywhere from 2 to 24 hours, I'd guess. Importantly, note that nearly all the important guidance takes place before the rod enters the atmosphere. Once in the atmosphere, it can only achieve minor lateral movement for fine adjustments. I'm guessing that the lateral movement range through the atmosphere is no more than 10 miles (the atmosphere is about 60 miles thick, roughly speaking). So once the rod drops into the atmosphere, it needs to be within 10 miles of the target in terms of lateral position (or headed on a path that takes it to within that window). That's why most of the positioning of the rod must happen in orbit, and this is why the launch angle and rocket boost after launch are so important to it striking its intended target on land. Here, I've shown that the kinetic energy delivered by a "Rod of God" weapon could reasonably match the first explosion observed in TianJin. I've also explained why the orbital velocity and atmospheric re-entry objections are not show-stoppers. The biggest question, in my opinion, is whether a rod can survive the extremely high forces of friction with the atmosphere as it plummets toward its target at very high velocities (Mach 12, for example). This is primarily a materials question, and there's no way we can know for sure what sort of exotic materials the Pentagon has developed. One thing we can know with 100% certainty, however, is that the Pentagon doesn't publicly disclose its space weapons secrets. If it does possess a Rod of God space weapon, it sure isn't going to announce it to anyone. Especially given how amazingly useful such a weapon would be for the stealth striking of enemy targets anywhere on the planet. Remember: if this weapon exists, it puts a weapon on target while producing no apparent launch signature. This is, in every way, a stealth weapon that no one can stop once it's launched. You wouldn't even be able to see it approaching, either. Dropping through the atmosphere at Mach 12, it would strike the target like a bolt from the heavens, causing enormous destruction and leaving quite a large crater in the ground, just like we saw at Tianjin.